PlayStation Store Kicks Off Halloween Sales With "Zombie Week"
Sony's first set of horror-themed discounts include The Walking Dead, The Last Of Us, and many more. Halloween is the time of year for impressive discounts on your favorite horror titles, and Sony is proving no exception. The PlayStation Network is rolling out an impressive array of videogame, movie, and TV price drops with the "Sale of the Dead", running from today until November 4th. The sale comes in two flavors: Next week's items will focus on horror in general, while "Zombie Week" opens today with extensive cuts to PSN's undead catalog. That includes everything from Rockstar's Red Dead Redemption: Undead Nightmare, to Naughty Dog's The Last Of Us, to the complete season of Telltale's The Walking Dead. The full list is available on the PlayStation Blog, but there's more than enough to satisfy the hordes of zombie fans out there. 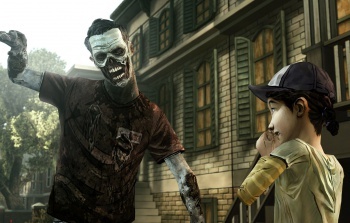 Outside of cutting individual The Walking Dead episodes to $2.50 each, the 400 Days DLC episode, The Walking Dead: Survival Instinct, and The Walking Dead for Vita have been discounted as well. Dead Island: Game of the Year Edition is $10 this week, while Dead Island: Riptide has a 50% reduction to $25. Resident Evil 4, 5, Code: Veronica X, and Revelations are all far more affordable today, while The House of the Dead Bundle helps round off your cheesy-zombie-shooter collection. Even Plants Vs Zombies is joining the sale, both for PS3 and Vita, with something more light-hearted and puzzle-oriented than the action titles above. Zombie Week runs until October 28th, at which point it makes way for Horror Week's BioShock, Dead Space, and Lone Survivor. Regardless, if you're playing to stay in and play games this Halloween, you'll have no shortage of options to choose from.